has the ability of air to air, or air to ground mission attacks. It can do hit and run attacks. Making it any American pilot’s dream to fly! It’s a multi mission aircraft. Its cockpit more advanced than the F-14 Tomcat. This is the Navy’s Top Gun. That sends the enemy on a fast cowardly run. That includes unlimited angle range attack. With a super speed that surpasses supersonic reaching over Mach 1 capability. It’s a true break for the sound barrier. It gives our Navy the ability. They soon hear the surround sound. It can reach its target whether the skies are blue or black. And only needs refueling every 2,084 miles or over. It carries with it 11 weapon stations. One of Boeing’s best creations! And it’s piloted by America’s best! So Americans can find rest. Not feeling a true warriors test. It’s America’s best fighter jet. 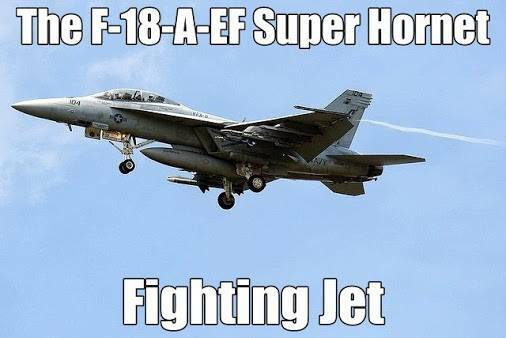 That makes any enemy sweat.The United States Navy F-18-A-EF Super Hornet Fighter Jet! ← You’ll Regret This Day!